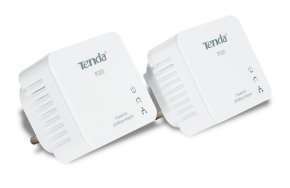 To Build a network at home or office with minimum effort and cost, the Tenda 200Mbps Powerline Adapter P200 is your choice. In many cases, Ethernet is just not available in places where network connectivity is needed. However, almost every room at home or in the office has a mains supply, which can be used to extend network connections from your broadband router. Simply plug one P200 adapter that links to a broadband modem/router into the mains socket in one room, and plug another P200 adapter linking to a PC or any Ethernet device in the other, you can then easily and instantly create a powerline network of up to 200Mbps, 2 times that of a traditional switch or router, with a distance capability of up to 300 metres, 3 times that of Ethernet cable. I don't see the word "homeplug" anywhere, neither "certified" nor "compatible", so these probably won't play nice with other makes. edit: Maybe the word appears on the box in one of the pix. Hard to make out. I don't see the word "homeplug" anywhere, neither "certified" nor … I don't see the word "homeplug" anywhere, neither "certified" nor "compatible", so these probably won't play nice with other makes.edit: Maybe the word appears on the box in one of the pix. Hard to make out. No need to be so pessimistic, of course these are compatible with HomeplugAV and are a bargain price with free delivery. Homeplug compatibility is a significant feature and one would have expected to see a mention in the description. Ebuyer messed up. As for pessimism- it's a good thing. Homeplug compatibility is a significant feature and one would have … Homeplug compatibility is a significant feature and one would have expected to see a mention in the description. Ebuyer messed up. As for pessimism- it's a good thing. - Compatible with Home Plug AV certified devices"
How did they mess up? It quite clearly says Homeplug compatiblity on the … How did they mess up? It quite clearly says Homeplug compatiblity on the Ebuyer description;"Tenda P200 - 200Mbps Mini Powerline Network Adapter Twin Pack- Ultra compact design - only slightly larger than a standard mains plug- Suitable for use with any wired network device- Ideal for Smart TVs, Blu-Ray players, Games consoles and more- Compatible with Home Plug AV certified devices"
It says so now, but it didn't when I posted my first comment. I expect eBuyer noticed the comment and fixed the description. They are not un-aware of HUKD. Is the connection stable on these, can I use it to stream video and play games? Does this mean these will work with my TP-Link TL-PA211 pair ?